President Hosni Mubarak succumbed to the demands of hundreds of thousands of his countrymen on Friday and resigned from office, bringing to an end three decades of autocratic rule. The announcement was delivered by Egypt’s vice-president, Omar Suleiman, in a brief statement on state television. 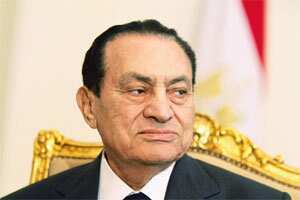 Mubarak delegated control of the country’s affairs to Egypt’s army, Suleiman said. “Because of the current circumstances in the country the President, Hosni Mubarak, has decided to step down, and the higher command of the army is taking control of the country," he said. The resignation was the culmination of nearly three weeks of protests that rocked Egypt and sent shudders through the region. It opens a period of uncertaintly, however, not only for Egypt, which will have to manage a period of military rule, but for countries such as Saudi Arabia, Israel and the US, for whom Mubarak has formed a key anchor of their policies towards the Middle East. US President Barack Obama has been informed of Mubarak’s decision to step down as Egyptian President and will speak to the public later about Mubarak’s decision, the White House said Friday. European Union foreign policy chief Catherine Ashton said that, by standing down, Mubarak “has listened to the voices of the Egyptian people and has opened the way to faster and deeper reforms", AP reported. Ashton said that “it is important now that the dialogue is accelerated leading to a broad-based government". Protesters, angered by a televised speech late on Thursday in which r. Mubarak disappointed expectations of a resignation, showed their strength by drawing massive crowds for an 18th day of demonstrations. Early on Friday, protesters filled Tahrir Square and spread their encampments to the state television building and the presidential palace. Both sites were heavily guarded, but the army didn’t try to stop the marches and even tossed protesters food and let them climb on their tanks. “I’m the happiest person in the world right now," said Gouda El Sayed, 22, a civil engineering student, as he danced under a massive Egyptian flag unfurled by revellers. “In seven years, I swear, we will be among the greatest nations on earth. We are going to clean it up. We’ve shown our will is strong." Outside the presidential palace 10km away in Heliopolis, women wailed in the streets, tears flowing from their eyes, their arms in the air. “Now our revolution is complete," said Ali Aboutera, a 26-year-old computer programmer who spent the day in front of the palace with a crowd that swelled to more than 20,000 as darkness fell. “A few hours ago, it was incomplete. But now we have achieved the Egyptian dream." Earlier in the afternoon, two large brown military helicopters flew out of the compound, banking over the crowd and prompting cheers—and speculation that the helicopters carried President Mubarak and his entourage out of the city. AP reported earlier that Mubarak had arrived at his residence in Sharm al-Sheik, a resort town at the southern tip of the Sinai peninsula. Aboutera predicted that the winds of change that swept from Tunisia through Egypt will now move to other stagnating regimes elsewhere in the Arab world. “I think within the year, the rest of the Arab leaders will be replaced by democratically elected governments," he said. “This can’t be stopped." Earlier on Friday, Egypt’s powerful armed forces backed the handoff of power from Mubarak to his vice-president and pledged to ensure the transition to free elections. The statement by the supreme council of the armed forces, read on state television by a TV presenter, appeared to be aimed at mollifying protesters’ concerns that the regime can’t be trusted to carry out the promised reforms. “We stay committed to the people’s demands and to ensure that they are realized, and to the peaceful transition of power," the military’s statement said. The assertion of authority by the army drew praise from leaders of the youth movements who sparked the uprising with an Internet organizational campaign and careful plotting of early street protests.